This afternoon with a lot of care and a bit too much fear I managed to get back into the pool. It was fair to say I was having kittens over the whole process, while I normally pull on my support network to help me overcome aver-city after getting the clearance from my surgeon and physio it was up to me to make it happen. I have to be careful with my pain management as I’m riding extremely high pain levels right now and I need to ensure that it is medicated accordingly. The problem with this is all the pain killers I’m taking come with strong drowsy warnings. The main one I am having to use right now not only makes me heavily drowsy, it puts me off balance and makes me nauseous. Not great when your feeling nervous to start with and in familiar surroundings but unsure of your abilities. So finally worked out that about after an hour of taking the medication I’m at a comfortable level where I can safely drive and leave myself enough time to get into and out of the gym and safely back home. Now it might seem I’m paranoid, we yes I am. It’s a battle for me to get around and because of my size and the crutches and the way I walk I do stand out. I need to ensure that I’m safe and I don’t put myself in a bad situation. Anyhow I manged to get a park right by the door and the lift is nearby. Headed up to reception to check in and pick up towels. I’ve been swapping messages with one of the PT’s at the Gym and I had hope to catch her today on my visit but I was thinking that she had left prior to be turning up. Turns out she spotted me just as I entered and we had a few great moments to meet and touch base. We had that little awkward moment where she looked at me, I looked at her and she ask ed “you wouldn’t be Ian by any chance?” I laughed and said “yep” When I looked at her I thought I wonder if that’s her., I thought to myself wouldn’t it be funny if we were to meet even when I’d written that chance off, we did! Something finally goes right, even something I hadn’t even planned! Was finally great to meet someone who I’ve shared a lot with, but never had the chance to meet until now. Back on topic, so rather than use the normal change rooms I used the disabled/ family change area. They do have a dedicated disabled change room but there are no lockers which didn’t make it practical for me to use. I preferred to use the family change area. A little hard to use as there are no seats of decent sized benches. Got changed and slowly made my way into the wet area. I’ve been a member of this gym for over 7 years and I know the pool area well. What I was worried about is the grip of my crutches on the floor, if they slip I’m stuffed. I learnt the hard way about slipping crutches on wet surfaces during the week when it rained. I put a lot of download pressure on my crutches and I need a solid, stable connection to the ground. Thankfully it was fine, got to the entrance of the pool, put my bag down and stored everything. Carefully limped over to the shower to rinse before entering the pool. Now at this point I was without crutches, slowly does it. 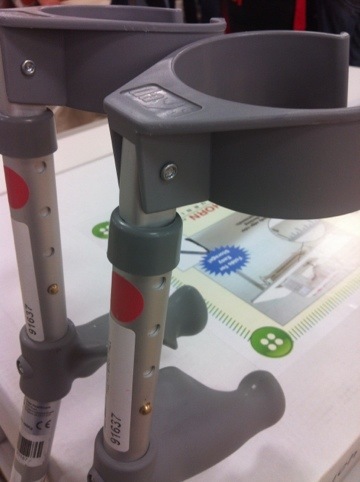 I really didn’t get any instruction on how to use crutches, they are fairly straight forward. to use. However one thing that isn’t easy to use while on crutches is stairs. I turned to YouTube sometime ago to help me deal with this. I’ve found YouTube to be helpful at times when searching for advise. As with everything in life particular online content check the source, the videos I’ve been using come from reputable sources. Anyhow back to the pool. Got onto the stairs and eased myself in, going up stairs for me is actually fairly easy, it’s going down that’s hard. I forgot how cold the pool at the gym is OMFG it’s cold! It was good in a way, it prompted me to get moving. I was confident this time it would be different, with the words of my Physio and PT in my head “go easy” I took my time in taking my first steps in the water. It almost felt like a baby learning to walk. I could feel the buoyancy of the water which really helped reduce the load off my knee and back (something that is a real problem on land) I did a couple of laps up and down. I started to feel more comfortable with this, so it then came time to try going backwards. This is a lot harder and I again used the underwater lane marker to ensure I kept straight. This lasted for about 1 length of the pool as I was so worried about how I was traveling I decided that was enough. I decided to continue, but any work was to be forwards. I did a couple more laps then I decided it was time to see if I could do sideways. I was initially cleared to do this but when I queried my Physio she erred on the side of caution. After trying a couple or steps it was clear this was not a clever thing to try and I stopped. Continued walking down the pool forwards for a few more lengths. It was then time to get into the Spa. The area this is in makes using and storing crutches difficult, so without them I carefully limped over and walked in holding onto the handrail for dear life! Spa was fantastic, so much warmer and nicer than the pool! I love the spa, I don’t have a bath at home and I so miss them. The warmth of the water the pressure from the spa jets was awesome. While I was nervous the entire time it was so great to get back into it. Sadly the strapping on my ankle didn’t hold up too well and I’m going to have to cut some of it off and re-apply. Only a small thing! Mind you I must learn how to stirrup strap, it’s going to serve me well. Planning to go back to the pool again tomorrow and the current tape won’t last a second visit, so I’ll have to give that some through as I don’t think having an untapped ankle in the pool right now is a great idea. Overall a really positive experience and I’m looking forward to doing it again. 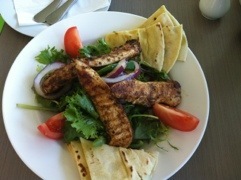 I write this blog entry as I’m at a local cafe waiting for them to bring me an amazing chicken salad. The past week has been very challenging, I’ve had a second surgical consult and the path forward is now clear. While surgery was a strong possibility previously there was not a strong diagnosis or treatment approach. There is no way I was going to consent to explorative surgery. The consensus from friends is that Sportsmed SA are leaders in dealing with my type of injury and with a suggestion from my podiatrist I selected a surgeon to meet with. Now I don’t think anyone should “love” there surgeon, but a straight shooter, no hold bars up front approach is what I needed and more importantly he provided. Explained to me what’s happened and more importantly the current and future management plans. I’ve had to take a lot of time off work as I have been struggling to cope with the most basic things, little loan hold up working full time. To their credit work have been incredibly supportive. Prior to the second consult on Tuesday I was at a massive loose end and starting to get really depressed. Gone was my normal cheerful self and the most mundane things were big efforts. With no clear path forward the road ahead seemed untenable. I’ve been credited as a positive thinker and while on the surface that’s true. Deep down its a battle. A battle not taken on alone, team pilko is now a group of 11 , I have brought together a massive team of people to get me through this. After a great consult with my Physio this morning who I think can read me better than I give her credit for, we both look at each other to gauge reactions. I try and hold my own particularly in pain. So despite trying to put on the brave face and say “it’ll be fine” my Physio really can read me like a book and know when I might be fibbing just that bit! I’m now stopping for lunch before battling a daemon head on. I believe most of my injury was either done in the pool or at least aggravated by it. Today a limited clearance from my Physio has been given to return to the pool. This is something that I’ve wanted to do for ages but wanted to make sure I wouldn’t aggravate what is already a sore and partially broken Pilko! With ankle strapped, I’m now preparing to return to the very place that this pain begun. With being out of the moon boot, I’m having to support the ankle myself and that is proving quite the challenge. The moon boot is great in supporting the ankle and taking pressure off, but it comes at a massive price as the joint is immobilized which weakens it. I’m a fighter and I’m going to reclaim the pool as the great place it deserves to be. Create some new memories, rather than reflect on the pain and suffering in the past. I look forward to sharing my experience with you. Because this blog is open to the world I need to be mindful of what I share. With that in mind I am drafting my next post and will publish it over the weekend. I have some interesting thoughts to share, but right now this blog will have to wait! Faced with an ankle that was getting worse than better I had a foam walker prescribed. Late last week I was ready to come out of of it, but I’m working on a very conservative front right now and wanted to make sure I had both specialist and Physio advise on managing with out it. It’s great at immobilizing your ankle, but it comes at a hell of a cost. You can’t get around as easily and you do have to inflate and deflate it each day. In my case it gave me stability and with the assistance of crutches meant I could get around a lot more easily. The time is now to stop using it and to re-train my ankle to cope with the load I’m putting on it. I decided to use the weekend to master this as I’m only going to put myself in familiar surroundings plus if I need to rest which I do need to frequently that’s fine. I don’t have to be anywhere on the weekend. When I first created this blog a few weeks ago I wanted a picture for the wall paper. A white or black background just didn’t seem to work. A quick Internet search came up with a black brick wall. It’s not meant to dwell on problems, more of the challenges ahead we face. This blog is about those challenges and how I’ve dealt with them. So I’ve got a lot to share and trying to work out how to best share it with anyone. Tonight’s topic is questions, there isn’t such a thing as a dumb question, well there probably is, but if you don’t understand something for goodness sake ask! I prepare for all the consults I have and am borderline OCD. One key example is today I visited my Physio, I’ve been consulting with her on a weekly bases since late January but due to Easter and me being away today was our first consult in three weeks. A lot of things have changed in that time, so I find the best way is to write down a list of topics/questions I have and then refine them. Personally I use Evernote which is available for free for both windows and iPhone, it means I can sync notes between my phone, iPad and computers. If you ever have one of those 2am moments where you think of something you can record it for later. I find that while I deeply appreciate the many consults I have with people, if I go in with my list of items to cover I get a lot more out of it. I think my Physio is beginning to dread my iPad, normally I only use my phone to raise questions, but if I have more to cover out comes the iPad. I don’t always ask the “right” question nor do I always get time to ask them all, but I find starting off with a summary and working my way through with them works a treat. My Physio particularly loves this as it means that the consult is structured and it give her a great indication of where I’m at and where I’m focused. There are times when you may not be able to be this prepared and that’s fine too. Consistency of care is important in these cases so the professionals you work with will get to know you and be able to “read you” for a large part of the consult, but they of course will still ask questions! Ask away my friends, if your as lucky as me your working with some amazing people and they are only too happy to share their wealth of knowledge with you. So the past couple of weeks have been really interesting. 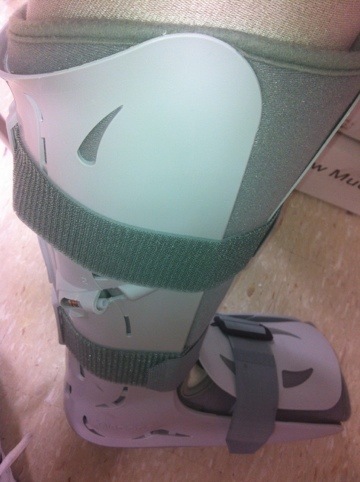 Until yesterday I have been getting around with a Aircast Foam Walker (Moon boot) and crutches. Today with advise the moon boot is gone and it’s just crutches for about a week. One of the key things I’ve found with my journey so far is you need to believe in yourself. I know it sounds dogy, something you’d see on an infomercial, but if you can’t confide in yourself, honestly what hope have you got! Now I’m not saying that you can do this by yourself, you need to have a good support network, this is the key. You Need to believe in yourself that you can do what your setting out to achieve and as part of that surround yourself with the right people. That’s where “Team Pilko” comes in. I didn’t know how to exercise or cook. Did I believe I could do it, yes I did! Could I do it myself? Well not really. So embrace change, motivate yourself where you can and take advise, you’ll be the better for it! So after creating quite a few posts in about 48 hours I’ve been spending time going back over the text I’ve written and removed quite a few “pilko” errors, wrong words and some paragraphs that were true ramplings. I’m on leave from work right now, but am choosing to use this time to take a big step back from social media and other online parts of my life and I really need to re-group right now. It’s all good, it’s great about once or twice a year to switch off and relax, this is what I’m doing. Will ramp up the posts over the weekend. So right now I’m struggling big time, I’m bouncing around various health professionals trying to get the right advise. In all of this I still have to be able to get around. It hurts to walk, it hurts to sit. 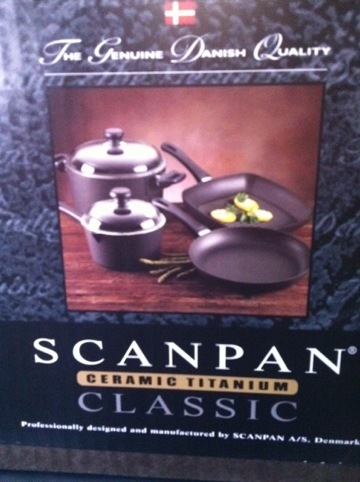 So a little while ago I decided we needed some new cookware, put it out to Facebook and scan pan was the go, David jones had a cookware sale on so score! RRP $1000 mine to take home for about $400-$500 bargain!